We have begun rehearsals in earnest for MKTOC’s production of “Fawlty Towers”, where we perform “The Wedding Party”, “The Psychiatrist” and “The Kipper and the Corpse”. 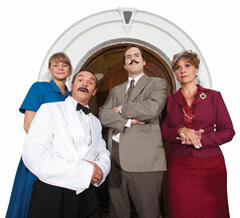 Steve reprises the role of “Basil Fawlty” with little acting required! We have started creative work on the Christmas Grottos Frosts Garden Centres - dreaming up a truly magical family experience for you!